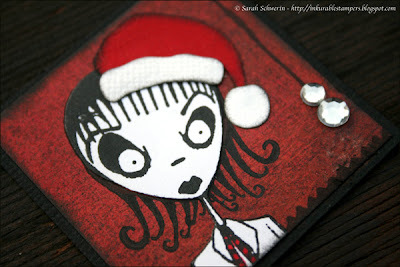 My Creative Existence: Creepy Christmas Twinchie Creations! Back in November 2009 my challenge at Inkurable Stampers was to create a Christmas themed Twinchie (a 2" square) AND use it in a project. You may have seen my example pieces last year over at Inkurable, but I haven't shared them here yet, so with Christmas fast approaching there is no better time than right now! (Otherwise I'd have to wait another year! LOL!). For my boy Twinchie I used a 2x2" piece of black cardstock as the base. I then attached some green lace "doily" paper (Basic Grey) to some red basic grey paper, and cut a square slightly smaller than 2x2". I inked the edges with black ink and then stuck it onto the black background square. I stamped a Stampotique stamp onto white cardstock with black ink and cut him out. I coloured his jumper with a red marker and his face with "Antique Linen" Distress Ink. 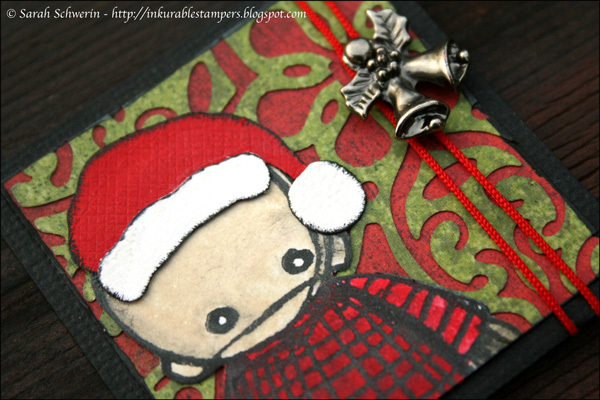 I die cut his Santa hat out of Bazzill cardstock using a Quickcutz Santa die and my Cuttlebug machine. I wrapped a red cord around the Twinchie and attached a pewter holly/bells brad. For my girl Twinchie, I again started with a black background square. I cut a piece of red Basic Grey paper and stamped the Stampotique girl onto it. 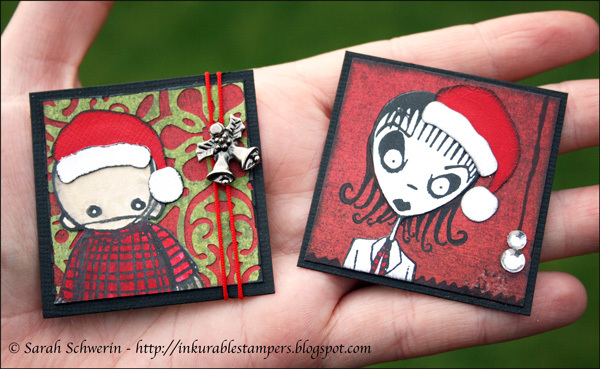 I then stamped the girl again onto plain white cardstock, and cut around her head, neck and body, then stuck her over the stamped image on the red paper. This was so I could have her in white without having to cut around her hair. Also gives her some dimension. I then colourd in her necktie with a red marker. Again, the hat is from a Quickcuts Santa die. I drew a black line on the side and stuck some Kaisercraft rhinestones to the end for a hanging Christmas bauble. I made 2 different Christmas cards using my Twinchies. My base card is black Bazzill cardstock. 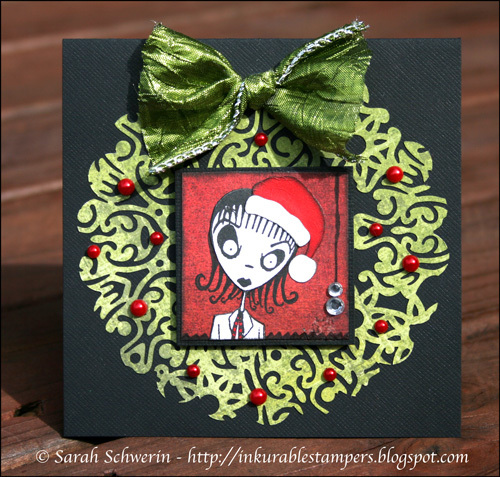 I die cut a bracket shape out of red Basic Grey paper and then embossed it with a Cuttlebug embossing folder. I sanded the raised surfaces, and then inked over the top with black ink for a grungy look. I mounted my Twinchie to the front of the card using double sided foam mounting tape, and then added Kaisercraft Rhinestones to the background for a bit of bling. Again I have used a black Bazzill base card. I made the wreath by die cutting some Basic Grey doily paper with a scalloped circle Nestabilities shape. I adhered the wreath to the card front using spray glue. I attached my Twinchie to the middle of the card using double sided foam mounting tape and used red Kaisercraft pearls to decorate the wreath. I created a bow out of some lovely green ribbon, and attached it to the top of the wreath. these are fab Sarah. I love the textural effect you incorporate into your work. I hate making Christmas cards - think it it's because I made about 200 each year for 3 years when we had a card stall in a local market. I love your cards, they came out great! I learned a new trick too--about stamping hard to cut out items onto card stock and then cut only the basic shape and put it over the stamped image. I never thought of that! Thanks! I always look forward to your posts and your spooky cool cards. Merry Christmas! These cards are great looking! I make all my Christmas cards...sent about half already..as some must travel far and wide:) the other half this week. love this card! the wreath around the photo is such a cool effect.